Voice.Global > Blogs > Voice – over or out? Of the ten Voice focus countries, the Civicus Monitor rates civic space in seven as obstructed (Kenya, Tanzania, Mali, Niger, Nigeria, Indonesia and Philippines), two as repressed (Cambodia and Uganda) and one as completely closed (Laos). Tanzania is currently under review following a general backlash om human rights, including but not limited to the shocking attempt of the capital’s governor to track down the LGBTI community through online surveillance. An overall alarming picture -which raises questions for the ability of Voice to operate and flourish. After all, if there is no space for local groups to raise their voice, what noise can Voice still make and support? Do we declare Voice – over and out? Or is there still room for voices to come out? There is no simple answer to these questions but through this blog I hope to offer some useful insights and a more nuanced view on the notion of civic space and inclusion in the context of Voice. In the last few months, in each country, Voice teams, grantees and other civil society stakeholders have taken a deeper dive into the context, an exercise which was also done at the beginning of Voice in 2016. The fully updated analysis of these findings will be available soon, but in general we can already say that for some Voice target groups space has opened and for others it has shrunk -in the case of the LGBTI community quite rapidly. In addition, the size of the space depends on the thematic focus of the grantees’ work plus the fact that within each target group there are even more excluded sub-groups which are making great strides to open up their own spaces -big and small. The best way to illustrate this is obviously through the eyes of the close to 200 grantees Voice has been funding. Below, I am highlighting some experiences of three target groups within Voice. In Mali, the work of seven out of the 14 Voice grantees focuses on the voices of people with disabilities, showing remarkable progress. 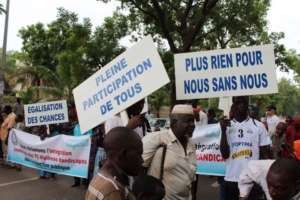 For example, the Malian Federation of People with Disabilities (FEMAPH), an influencing grantee, advocated successfully for the adoption of a social protection law for people with disabilities in January 2018. They continue to raise the issue of inclusion, collectively and in a coordinated fashion: at times even take to the streets to show their force! Nothing About Us Without Us signs at the street protest FEMAPH organised in Bamako, Mali. Generally speaking, the space for People with Disabilities in all ten Voice focus countries has opened up -especially for the impact themes related to increased access to social services and productive resources. We have not yet received a lot of applications from Disabled People’s Organisations to foster the space for political participation as that may change the picture! Access Nigeria, a campaign to promote more inclusive politics and one of the winners of the NOW-Us! Award will help us lead the way to learn more about civic space in that impact theme! In addition, Voice has supported (small) groups that focus on the more ‘unusual’ or specialised disabilities: people with albinism in Mali, Tanzania and Uganda or small people in Mali. And there is a growing group of grants supporting the work of people with mental, psycho-social or intellectual disabilities. Having never had a civic space to begin with, they are showing that coming to or finding your voice is an important first step in expressing yourself and towards inclusion into society. The groups do this not through conventional therapy but through fashion, art, spoken word and theatre, such as for example Let’s Speak Up in Indonesia and Voices of Kids with a Difference in Mali. 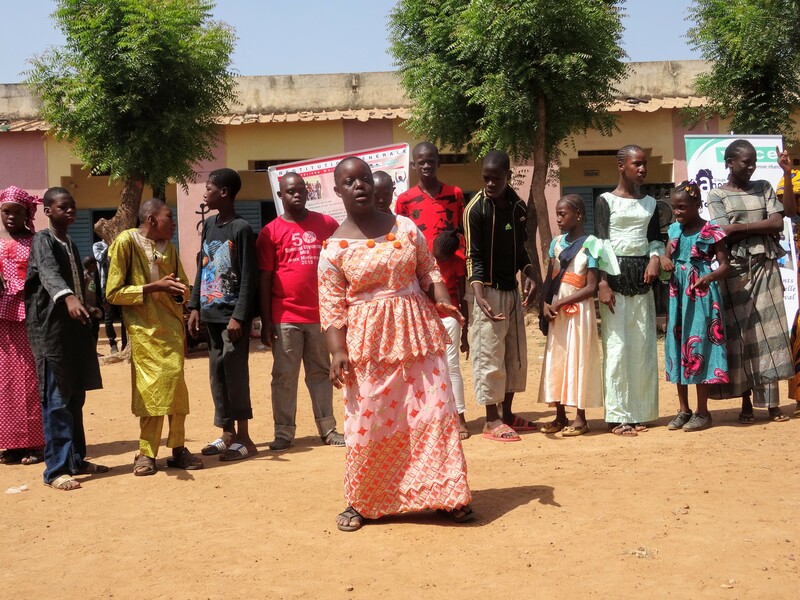 The singing voices of Kids with a Difference in Mali. Coming to voice is an important step to express themselves creatively. Unfortunately, it is a different story altogether for ethnic minorities and indigenous people, both in Africa and Asia. Most of the groups Voice supports are working on land rights which has become a highly politicised issue in the context of corporate land grabbing and the right to self-determination. For example the Ujamaa Community Resource Trust, a global Influencing Grantee working on land rights in East Africa had to shift some activities and budget when one of their local partners was not granted permission by local authorities to work with communities on land issues. In the Philippines -where the civil society operating environment is generally in peril due to increasing authoritarianism- we are supporting a lot of work led by indigenous people in the Mindanao and Cordillera regions, leading at times to issuing statements of solidarity. In certain Voice focus countries in Africa and Asia, such as in Uganda, Tanzania and Indonesia, the general space for the LGBTI community has shrunk alarmingly. I already referred to the case of Tanzania where the LGBTI community has been witch hunted following the statements of the local governor in Dar Es Salaam. Luckily the international community is stepping up with the World Bank withholding a U$300 million loan and suspending all missions because of “threats, harassment and discrimination against the LGBT community”. Visits will not resume “until [the World Bank] can secure the safety and security of all employees”, the Guardian said. Unfortunately the same trend is happening in Indonesia. On a more positive note, in Asia, empowerment grantees focusing on LGBTI inclusion in Laos and Cambodia, Proud to be Us Laos and CamASEAN respectively, show more success in finding their voice and mobilising and organising a growing LGBTI community. Plus Voice is supporting more regional LGBTI inclusion projects through Finance Inc from APCOM, an influencing project to advocate for a more inclusive finance sector, including the Asia Development Bank. Key secret to success: Nothing About us Without Us ? I am sure we will have a lot more to say once we have the fully updated context analysis but the above experiences paint a diverse picture on civic space within Voice. Yes, it is a challenge for some but not (yet) for others and within Voice we aim to be pro-active and flexible with, for example, especially our Sudden Opportunity grants. This is also in line with the recommendations of a recent report the International Centre for Non-Profit Law published titled Effective Donor Responses to the Challenges of Closing Civic Space. The report comes with a list of handy recommendations to donors on how to deal with the issue of civic space. Another recommendation from that report is that donors should be supporting “enhanced CSO accountability to the community and to their constituencies”. Voice does this to the maximum by promoting the principle of Nothing About Us Without Us in our selection, ensuring that the distance between the civil society groups and their constituencies is as small as possible and in the case of target group-led organisations virtually non-existent. Might that be a solution to opening up space? All in all, Voice is not over and out but rather out! This is an article in light of the Together We Speak Campaign held between 16 and 18 November 2018, and organised by Civicus.